1. I am now 2/3rds of the way through finishing my first book and I think I’m going to have to take some time away from it before I begin editing so that I can come back to it with fresh eyes. 2. I have officially filled up every bookshelf I own and I currently have to navigate around piles of books on the floor and on my desk. I may be overdue to buy another shelf. Personally, I feel as though you can never own too many books (especially if they are books you enjoy), so for the moment, I don’t mind the mess too terribly. 3. 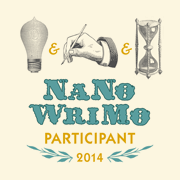 I’m going to try out NaNoWriMo this year. If you’re participating, let’s be writing buddies! It’s OK to hate everything you write, so long as you write. 5. Lately I’ve been making an effort to do a lot of free writing and it’s resulted in several ideas I plan on keeping for later. Writing daily is the best habit I’ve picked up both for brainstorming and for overall improvement. 6. Great (but older) post from Alexandra Bracken on why not everything she writes needs to be something she submits.